Haunted by her mother’s disappearance and plagued by nightmares, eighteen year old Rowan Munro abandons London for Dorchay, the remote Scottish village where she spent her childhood. With the help of her eccentric aunt and a familiar face from her past, she unlocks a power in her that is at once terrifying yet curiously addictive. As she uncovers the deeply buried secrets of her family, she awakens something only imaginable in her worst nightmares. The Hunter: centuries old, malevolent, ferocious… and intent on killing Rowan and those closest to her. To survive, Rowan must learn to harness her new-found inheritance, and use her powers to finally confront the brutal, murderous force which has plagued her family for generations. About the author: Heather Blanchard lives in London with her husband Paul. With a childhood spent in the Scottish Highlands and Yorkshire, she developed a passion not only for books, but also for creative writing. Dark is the Sea, her first novel, emerged from a love of ghost stories, fairy tales, folklore, and old movies. As an only child growing up in the Scottish Highlands, Heather Blanchard says it was easy to get carried away with her own imagination from a young age. Local folklore and ghost stories always intrigues her and influenced the type of books she read - and now writes. 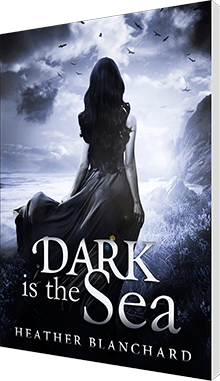 Dark is the Sea is the must-read debut from Heather Blanchard, driven by a fiercely modern heroine, it’s sure to draw in fans of dark fantasy, the supernatural and beyond. In her debut novel, Heather Blanchard skilfully combines elements of the Gothic novel, romance, nature folklore, witchcraft, and fantasy to create a story that will appeal to young adults and older readers alike.